Cells of kidney organoids share the same cell type–specific transcriptional trajectories as developing human kidney. (A) Correlation matrix comparing gene expression profiles of cells in clusters from organoids (whole well) to developing human kidney of estimated gestation days 105–115. The intensity of the overall image was adjusted to maximize the discernable visible range of Z score intensities, color indicates correlation (red, positive; blue, negative). (B) Overlaid trajectory analyses of combined single cell transcriptomes from developing human kidneys, whole well organoid cultures, and isolated organoids. N, cumulative number of transcriptomes used in trajectory analysis, and n, contributing number of transcriptomes from each dataset. See related Supplemental Video 1. (C) Trajectory segment cell type assignment of developing kidney and organoids based on gene expression patterns as in Supplemental Figure 2B. 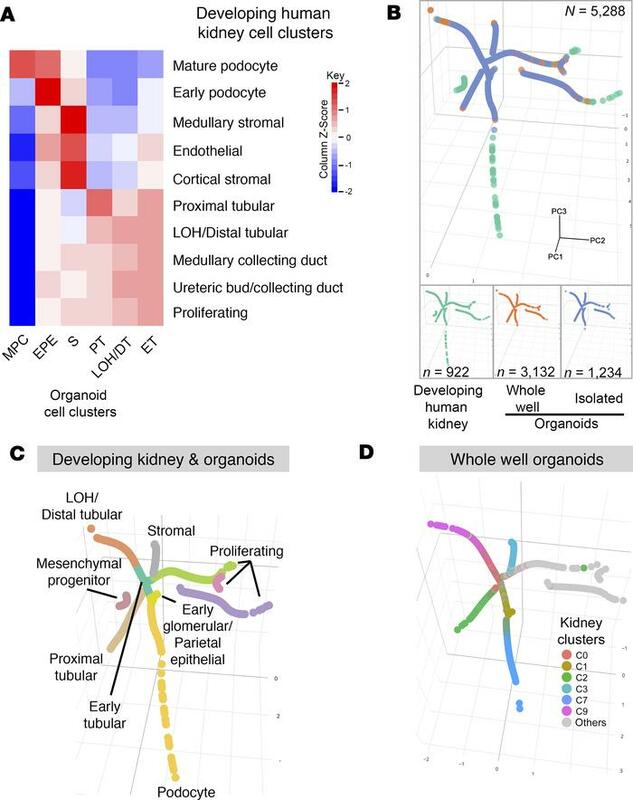 (D) Superimposed t-SNE cluster cell type assignments of selected kidney clusters from whole well organoids only (see Figure 2C) overlaid on cell lineage trajectory. Cells from all other clusters are represented in gray. See related Supplemental Figure 2.